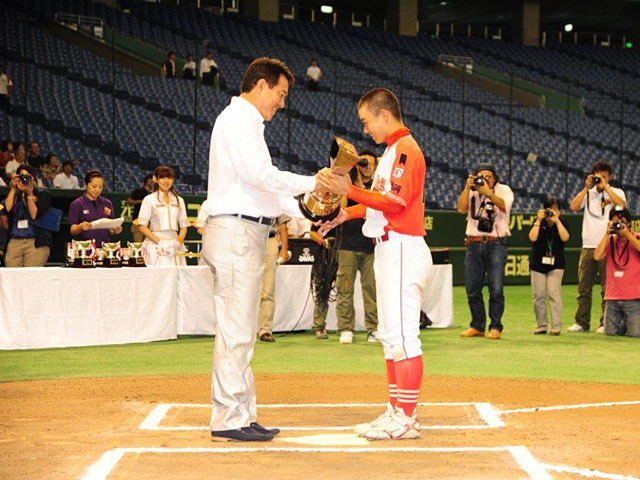 5th All Japan U15 National Baseball Championship (Giants’ Cup) was won by Iizuka Rising Star Boys of Fukuoka prefecture, and Tatsunori Hara, Manager of Japanese professional major league’s Tokyo Yomiuri Giants and the recipient of IBAF Best Manager’s Award in 2010, presented Champion’s trophy at Tokyo Dome on August 12. (picture by Photo Create). 32 teams which won preliminaries out of total 1,447 teams from 7 youth leagues competed in the 15U Championship. Japanese National Team Players for the 14th IBAF 16U Championship in Mexico have been selected from these 7 youth leagues (Little Senior, Boys, Young, Pony, Sun, Fresh and Japan). After the training camp in Chiba from August 14, they will leave for Mexico on August 17.